I made this Italian Cream Cake for a co-worker for her 9th anniversary last week. I haven't made an Italian Cream Cake in a long time and I forgot how good they are. The combination of moist cake and rich cream cheese icing is always delicious. I love buttermilk in cake recipes, I think it results in such a moist cake. I based this cake off a recipe I found on Tasty Kitchen from Pioneer Woman. Well actually the recipe was given to PW from a woman named Billie; this is a classic old recipe. I made a couple slight changes, using pecans instead of walnuts and not adding the nuts to the frosting for the cake but only the filling. I then used chopped pecans to coat the sides of the cake instead. The resulting frosting still includes the nuts, but in my opinion, makes for a prettier presentation. Preheat oven to 350 degrees. Spray three 9" round cake pans with baking spray or grease and flour. Beat egg whites in a clean mixing bowl, increasing speed from low to medium high until you reach stiff peaks. Set aside. In a large mixing bowl, cream together butter, oil, and 1 cup sugar until light and fluffy, about two minutes. Mix in the egg yolks and vanilla and mix until well incorporated. Add in the coconut and mix to combine. In a separate bowl, combine flour, baking soda, baking powder and salt and whisk together. Alternate adding flour mixture in three additions and buttermilk in two additions to the batter, beating until just incorporated after each addition. Once complete, fold in egg whites. Fold in 1/3 of the egg whites first to lighten the batter, then gently fold in the remaining egg whites. Divide batter evenly among pans, sprinkle the tops with one tablespoon of sugar each. Bake approximately 20 minutes until a toothpick inserted in the center of each comes out clean. Tops should be golden brown. Cool in pans about 10 minutes, run a knife around the edge to loosen and invert onto a rack covered with wax or parchment paper. Flip right side up and let cool completely. Combine cream cheese and butter in mixing bowl and beat until light and fluffy, about 3 minutes. Add vanilla extract and beat until well incorporated. Gradually add in powdered sugar, mix on low speed until the frosting reaches the desired consistency. Remove approximately 1/3 of the frosting to a separate bowl to make filling. Add coconut and 3/4 cup chopped pecans to the filling and mix well. Set aside remaining frosting to ice the cake. Level tiers as necessary. Add about a tablespoon of frosting to the center of the cake board or platter to prevent cake from sliding around. Place first tier on a cake board or cake platter, top with 1/2 of the filling mixture, leaving about a 1/4 to a 1/2 inch border around the outside of the cake. Smooth filling with an offset spatula. Top with next cake layer, pressing lightly to level, and add remaining filling. Smooth and top with final cake layer. Place in the freezer for about 15 minutes to firm up the filling. Crumb coat cake with frosting and return to freezer for about 15 minutes to set. 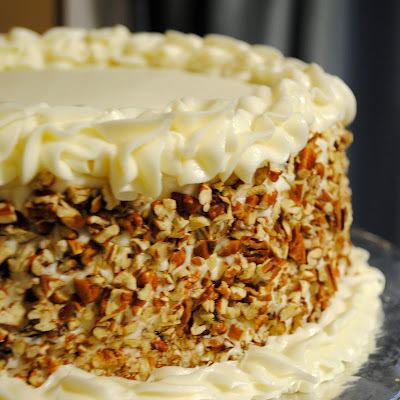 Ice the cake with remaining icing, adding chopped pecans to the side while icing is still wet. Smooth the top and pipe on decorative borders as desired. Store cake, covered, in the refrigerator. Thanks Amy -- I just checked yours out and it looks great! I've been wanting to try out this recipe but without nuts. It looks great! This looks great! I've never had this before but it looks really yummy! I've made this recipe from PW before, and it is EXCELLENT. I love your different presentation though - I'll have to try that next time! This looks delicious!! I've never made a cream cake before! Looks simple enough. You have great decorating skills!! This cake sounds amazing! My parents used to buy Italian cream cakes all the time from the local bakery when I was a kid. I think they would be floored if I recreated it! Beautiful decorating! Can you make the cake without coconut? @Theresa - I've never tried it. I'm guessing you could but it probably would be a little plain. yum! looks delicious! I haven't had Italian cream cake since high school maybe?? It used to be my brother's birthday cake of choice! 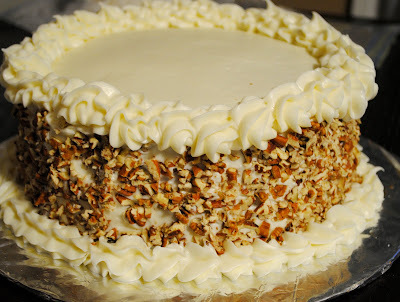 Italian Cream is one of my favorite types of cakes! This looks gorgeous! Hi, I just brought this cake out of the oven and it smells so good, but the layers are not high at all. Were your layers thin? From your picture, it does not look like it, but I know sometimes pictures can be different than what it really looks like. I just measured it and it looks like they are only about an inch high. I am finishing this cake up tomorrow to give to a friend to take to work. I hope it comes out good. My layers were probably around 1 1/4" - 1 1/2" tall. The cake barely fit in a 6" deep box when I was done with it. Maybe your baking soda/powder weren't fresh enough? Either way, I'm sure it will be delicious. Vanessa - the egg whites could definitely make a difference, make sure you don't overbeat them either though, stiff peaks are good but if you go to far, they will be dry and start to break down. It can be a quick change from soft peaks to stiff peaks. I am going to make this, but will use Coconut Oil instead of veg oil. Much healthier and yummy. This is the best looking presentation I've seen, and I've been looking at ICC recipes all day, since I'll be making one tomorrow for Grandson's bday. Thanks for posting the inspiring pix. How do you think cool whip topping will be. I don't think I would go with the whipped cream topping - the cream cheese icing goes really well with it with the tang of the cream cheese. Cool Whip or whipped cream would probably be a little light. It also doesn't hold up very well but if you planned to serve the cake same day and don't expect leftovers, it would likely be fine. Hope you like it, whichever way you decide to go. I am going to make the cake today for the first time! I am interested to know what is the purpose of the baking powder. In the cakes that I have made they have not required baking powder only baking soda. Also, I wanted to know if it would change anything to add pecan in the batter? Most of the cakes I have seen have the pecans in the batter. Your cake looks awesome. I hope I get similar results. Thanks for sharing! When I was first starting off with my blog, I came across this recipe and decided to make cupcakes with it instead and I kid you not, week after week, it gets the most views. Thanks for the awesome recipe!! @katie - glad you enjoyed it! What does crumb coat the cake mean? Which part of the cake are u doing that to?? The side? The top? 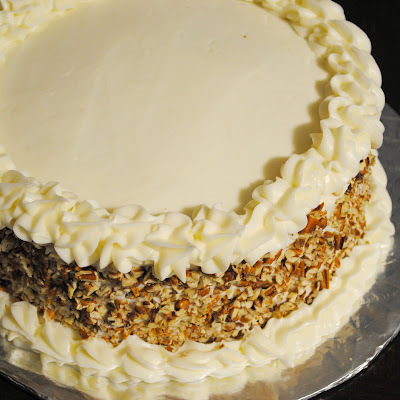 @Whitbey - a crumb coat is a very thin layer of frosting applied to the entire cake to "seal" in any crumbs. You then frost the entire cake again with a final/finish coat of frosting for a more professional appearance. It's not going to affect the taste of the cake at all, it's purely an aesthetic thing. If you don't want to worry about it, skip the step and just frost as you normally would. Oh ok thank you that totally makes sense!! Can't wait to make this looks fabulous!!!! @Whitbey - glad I could help - hope you like it! Can this cake be made without Coconut? Mu husband loves Italian Cream Cake but hates the texture of coconut. Please advise. I've heard it makes a difference in how the cake turns out. I've not made the cake without coconut before, however, even people who claim not to like coconut have liked this cake. I'm not sure what the result would be, I did get a few hits for ICC without coconut on a google search though so it can be done but I don't know what other adjustments you would need to make. Sorry I can't be more help. I have made 4 batches of this cake in the last week ! It is awesome ! Made this cake for family holiday gathering and everyone went crazy over it. Did make one modification used neufchatel instead of cream cheese. I made this cake for a dinner party, substituting mascarpone for the cream cheese in the icing with great results. It was a HUGE success! Nothing beats the flavor of a made-from-scratch cake. Thank you for this recipe and the pictures of your fabulous presentation. I may give this a go---with one change---I would use a custard cream for the layers(the type used in cream puffs that are always present at an Italian wedding. I made this cake from the same recipe as Billie from Pioneer Woman. I don't eat a lot of sweets, my 1st piece, I thought was overly sweet, probaly because after frosting the cake, I snacked on the leftover frosting on the beaters etc. But after putting the cake in the refrig over night, a slice was really good. I then froze individual slices in wax paper, then saran wrap over the wax paper. This was also very tasty frozen. Since this is a large cake for one person, I shared half the cake with my neighbors and they loved it. I like the idea of using a custard cream Pacicca, would you share your recipe for custard cream? I made this same recipe from PW for my sister-in-law's birthday party today. Wish I could post a picture. Thanks so much for the idea for leaving the top smooth so as to decorate it. She loved it! I have an "in home" baking business and I baked an Italian Cream Cake just recently as a gift. I wish I had seen this presentation before I made it. This cake is BEAUTIFUL! I will be using this idea the next time I make one! Thank you for sharing!!! Would it be okay to add a box of vanilla instant pudding to the mix to make it extra moist? I haven't tried this but I would imagine you could. This gorgeous cake is featured today in my new roundup "10 Cakes That Could Win A Beauty Contest". What a work of art!